It’s a good thing that I enjoy the Monogatari franchise. If I were less inclined towards it, I might start thinking of it as the Hydra of the anime world, cut one head off and another two appear. This time, in between reviews of Owarimonogatari Parts 1 and 2, they announced a second season of Owarimonogatari. I begin to wonder just how many secrets Koyomi Araragi has left for Ougi Oshino to elicit. We go back in time for Owarimonogatari, not long after the events of Bakemonogatari, back when the enigmatic Ougi Oshino (Meme Oshino’s niece) first transferred to Koyomi Araragi’s high school. Six episodes of Owarimonogatari are presented on this dual layer DVD disc from MVM. You can also get Part 2 on Blu-ray on the same day. 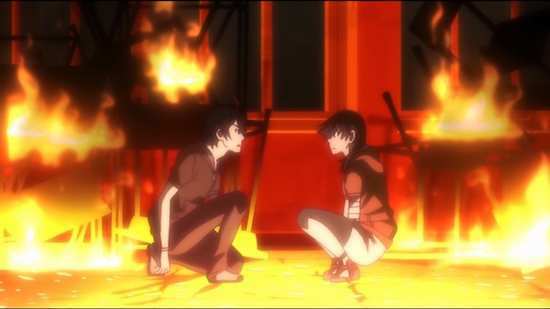 In part 1 of Owarimonogatari, Ougi Oshino pressed Koyomi Araragi to discover the true nature of his past with classmate Sodachi Oikura. But there’s another truth that Koyomi Araragi has yet to reveal, just what happened while Tsubasa Hanekawa was dealing with that giant talking tiger, when Araragi was nowhere to be found? It turns out that doing a favour for someone, he had contacted Suruga Kanbaru, when they were both confronted by an animated suit of armour, with a voice demanding the return of the Kotori Watari sword, then in the possession of diminutive vampire Kiss-Shot Acerola-Orion Heart-Under-Blade, a.k.a. Shinobu Oshino. Owarimonogatari gets a 1.78:1 anamorphic transfer in the native PAL format on this DVD. It’s a clear and sharp transfer, rich in detail, with smooth animation, and an absence of artefacts or obvious aliasing. It’s just the image quality you’d expect for a Studio SHAFT animation, one of the Monogatari series. Expect inventive and varied visuals, odd camera angles, lots of characters looking back over their shoulders, and of course the fan service. Also, just like the Bakemonogatari releases Owarimonogatari reveals signs of edge enhancement when scaled up to a large HD screen, making the Blu-ray the obvious choice for those who are capable. You have a simple DD 2.0 Stereo Japanese track, with a translated (white) subtitles and a signs track. The subtitles are removable, should you wish to take in the imagery without it being marred. There is no English dub to this title, and dubbing that intense verbiage, all those witticisms and puns would be a colossal effort. The dialogue is clear throughout, and the stereo gives a little space for the music and action. The music too is pretty effective; I certainly appreciate the theme songs. Once again all the on screen text is translated, and you’ll spend a fair bit of time manning your pause button to get everything read. The disc loads up a static menu screen. The only extras are the textless credits. The usual Fire Sisters next episode previews are unfortunately absent. 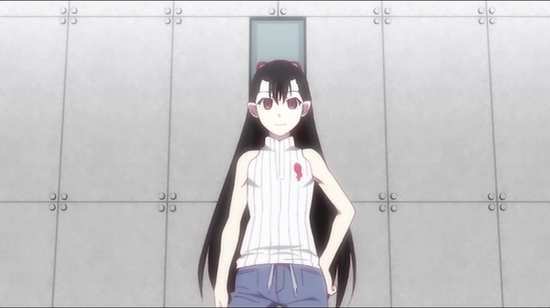 Owarimonogatari Part 2, or should I say Season 1 Part 2 arrives, and with it comes the deflating feeling of a show that’s lost its oomph in its second half. Part 2 is watchable certainly, the quality of the animation never wavers, the strong character writing is still very much evident, it’s just that the story never comes up to the standard of Part 1, and that is disappointing. The thing about Part 1 and its three part story featuring Sodachi Oikura was that it was all new information. This was a story that we had never encountered before, and we also learnt something new about the main character, as it revealed his past, to that point never discussed in the Monogatari franchise. It was all character growth and development and it was just one more reason to stay glued to the screen. That reason isn’t evident in Part 2. 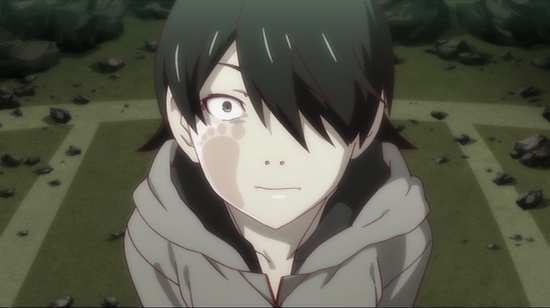 We’re not going to learn anything new about Koyomi Araragi here, as it covers a period in his life that we are familiar with, albeit from another perspective. The events in this story occurred during Nekomonogatari White, when Tsubasa Hanekawa and Hitagi Senjyogahara had that giant talking tiger to deal with. They couldn’t get in touch with their usual hero, Koyomi Araragi, and had to figure things out themselves, right until the end, when Araragi, the White Knight showed up with the Kotori Watari sword to save the day. This story looks at just why Araragi was out of touch, and as the episode titles suggest, it comes down to the diminutive blonde vampire Shinobu. And once again, the story that plays out in these episodes follows on from a story that we have already encountered in the franchise. 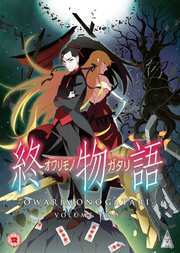 This is the conclusion to a tale that began 400 years ago, when Shinobu, then known as Kiss-Shot Acerola-Orion Heart-Under-Blade first came to Japan and created a minion or master depending on your perspective, someone with whom she had a similar relationship to the one she now has with Araragi. The first relationship didn’t end well, her minion didn’t take well to being made a vampire, and he wound up committing suicide by walking in the sun until he turned to ashes. All that Shinobu was left with was his sword. For the last 400 years, the ashes have been putting themselves back together, and now Shinobu’s first minion is back, looking to retrieve his sword, and it seems also resuming their partnership where it left off. The only problem is that Araragi is in the way. 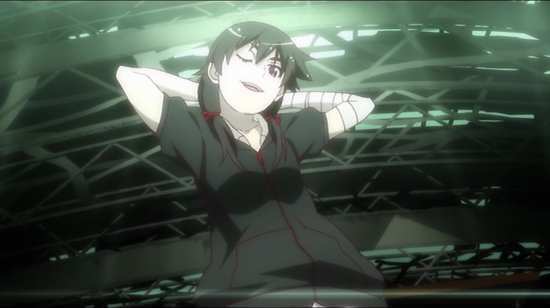 If you’re looking for the same character interplay, the love of language, of wordplay and witty dialogue, then you certainly won’t feel let down by Shinobu Mail, and in its favour, it has the playfully perverted Suruga Kanbaru as a significant character during the runtime. 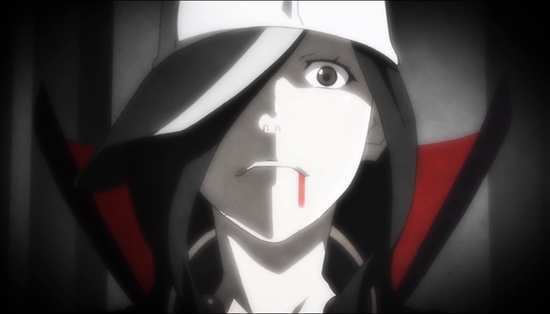 Her interactions with Araragi are always worth their weight in gold, and I have to admit that some of the best such moments are in this collection of episodes. But the story itself feels more epilogue than fresh, and given the first half’s ability to tell its stories in two or three episode chunks, the six episodes to Shinobu Mail already feel overlong before it becomes apparent that the story itself is too thin to carry the episode run. Then there is the moment in any show that I hate, and which the Monogatari franchise usually manages to cloak, the exposition dump. There is usually a character that has to explain what is going on, and the trick is to make it not seem that way, through action, through direction, or through clever dialogue. In Shinobu Mail, we pretty much get an unvarnished exposition dump and it sticks out like a sore thumb. Owarimonogatari Part 1 was the show at its best. Part 2 on the other hand is the Monogatari franchise at its worst. In this case those are relative terms though, and even at its worst, this show is well worth investing in, and remains a rewarding viewing experience.